Playa Vista is one of the most in demand LA neighborhoods right now and for many considered ground zero of Silicon Beach which is itself the epicenter of tech startups in southern California. The Wall Street Journal highlighted Playa Vista as the perfect place for creative entrepreneurs. None of this should be surprising because the ground below Playa Vista has a long history of engineering related innovation. The area was the headquarters of Hughes Aircraft Company from 1941 to 1985, and was the site of the construction of the Hughes H-4 Hercules "Spruce Goose" aircraft (for those who saw the movie The Aviator). Playa Vista buyers are buying more than a place to call home. They are truly buying a lifestyle. Residents have two fitness centers, The Resort and The CenterPointe Club, for fitness and indoor or outdoor swimming. There are also 29 parks, dog parks, community gardens, a Farmer’s Market (if you can’t find what you want at Whole Foods), a library, school, movie theaters, restaurants and shops all within the community. Don’t feel like driving? You can hop onto the Daily Shuttle or on the weekend take the Beach Shuttle to Mother’s Beach in Marina Del Rey or the Venice Pier. And remember what I mentioned about the Spruce Goose? Well now Google has moved into the massive airplane hanger where it was built. You don’t have to look any further than Playa Vista to figure out how to create a luxury, upscale, hip, master planned community. At Playa Vista you can find everything from high end rental units to attached and detached Townhomes. Prices range from under $1,000,000 for resale condos up to over $4,000,000 for new construction Single Family Residences. The current development began in 2002 with residential, commercial, and retail components and new homes are still being built today. Other than the difference between Phase One and Phase Two, there are not defined micro markets because each building or project is its own micro market. Phase One homes are subject to Mello Roos taxes while Phase Two are not. All homes pay the community HOA dues (PVPAL) and separate HOA dues based on the building. When sold the .75 of 1% Community Enhancement Fee. I once heard someone say you should live where you most feel like “you”. For me, that’s Venice CA. Maybe it’s the artist bohemian vibe or because I was such a fan of the rock band the Doors back in the day. Or that I just love Abbott Kinney Blvd which GQ once called the "coolest block in America", even though it is actually it is a few blocks of super hip shops, restaurants, and art galleries. When most people think of Venice, a few attractions also come to mind: the world famous Boardwalk, the Canals, Muscle Beach, and the the Skatepark. The world famous 1.5 mile long "boardwalk" (which is actually concrete), is one of the best places in LA for people watching. You will often find dozens of street performers including musicians, mimes, fortune tellers, acrobats, you name it. And some are actually quite good. And then there’s the storefronts selling the usual assortment of t-shirts and souvenirs. The 3 miles of beach are great for surfing, swimming, body boarding, roller balding, biking, playing volleyball or any other active beach activity you can think of. Bring your own toys or rent what you need from the many vendors. A few of my favorite restaurants are in Venice. I love Rose Cafe any time of the day. I once heard it described as “boho-chic” whatever that means. It has 2 patios, a bar and a bakery. On Abbott Kinney, make sure you check out Gjelina which is more rustic. And for those of us who enjoy lifting weights, there’s Gold’s Gym opened in August 1965 by Joe Gold long before the modern day health club existed. Featuring homemade equipment and dubbed "the Mecca of bodybuilding", it was frequented by Arnold Schwarzenegger and featured in the docudrama Pumping Iron (1977), which brought attention not only to the gym itself but also to bodybuilding in general. To this day, Gold's Gym is considered a landmark in bodybuilding culture and has achieved cult status. The canals were built in 1905 by developer Abbot Kinney (yes, the man, not the street) as part of his Venice of America plan to bring the feel of Venice, Italy, to Southern California. The canals are roughly bounded by Eastern Court on the east, Court A on the south, Strong’s Drive on the west, and Court E on the north. There are four east-west canals (Carroll Canal, Linnie Canal, Howland Canal, and Sherman Canal) and two north-south canals (Eastern Canal and Grand Canal). At the time, he lit canals with gondoliers and arched bridges drew widespread publicity and helped sell lots. As the automobiles became more popular, the canals were viewed by many as outdated, and the many were filled in by 1929 to create roads. By 1940, the remaining canals had fallen into disrepair, and the sidewalks were condemned by the city. The canal district remained in poor condition for more than 40 years, as numerous proposals to renovate the canals failed. Finally, by 1992 they were drained and new sidewalks were built. The canals re-opened in 1993 and have become a desirable and expensive residential neighborhood. The Marina is actually the world's largest man-made small craft harbor with eight basins having a capacity for 5,300 boats. The Los Angeles Times said it is "perhaps the county's most valuable resource". Well I’m not quite sure about that, but Marina Del Rey isn’t the forgotten neighborhood it was ten years ago. Wherever you look there has been revitalization, new construction and improvement. Starting with the revitalization of the Waterside shopping center, then the retail on Maxella and the building of the hip arts / loft district around Glencoe, the lifestyle and face of the area has really changed. It has a much different vibe than years ago and there’s more to come. If you like being on the water, try kayaking in the Marina. There’s a few vendors that rent kayaks and will even give you some instruction near Mother’s Beach. For the less adventuresome, you can always take one of the dinner cruises. From June through September hop on the Water Bus which conveniently makes 8 stops around the Marina. And guess what? It only costs $1 each way. What else can you do in LA for $1. If you are thinking of buying a home in MDR, other than price, one of the first decisions you’ll have to make is east or west of Lincoln and SFR or condo / townhome. Because some of the high rise condo buildings are much taller than anything surrounding them, many units have ocean or city views and some have both. I’ve always thought of Santa Monica as the heart of LA because It seems like everyone’s path crosses there at some point or another. Or maybe it’s because most of us take our tourist friends to the 3rd Street Promenade, the Pier and Ocean Ave when they come to visit. Personally, I really like the stretch of Main Street that runs down to the Venice Border. More local and less tourists. 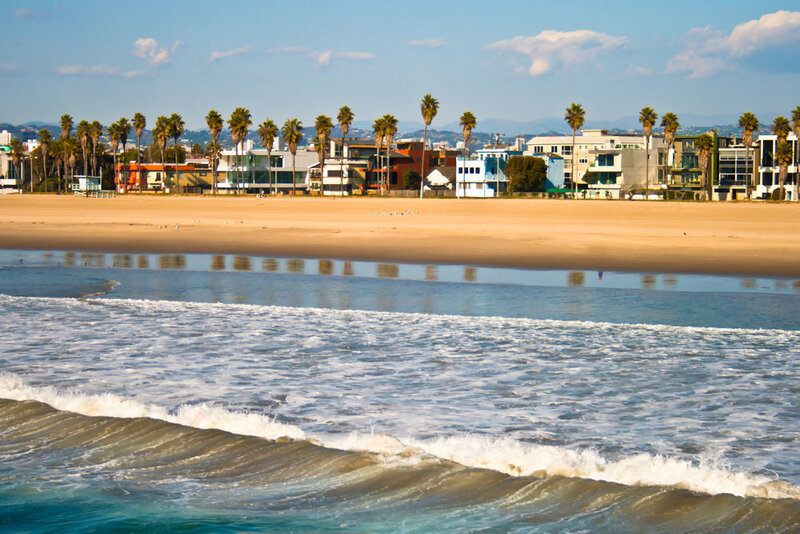 Plus that great vibe of Venice meets Santa Monica. I love that Santa Monica has had a bike sharing program since 2015 (that has now been expanded to Venice) If that wasn’t cool enough, in 2018, Santa Monica issued permits to Bird, Lime, Lyft, and Jump Bikes to operate scooter-sharing systems in the city. I’m not likely to try a scooter but I love biking and wish where I live we had something similar. If you like biking, make sure you take a beach cruiser to the Marvin Braude Trail (also known as the Strand) which is a paved bike path on the beach. While Playa Del Rey is not often considered part of Silicon Beach per se because there are not a lot of tech jobs here, it is just down the road from Playa Vista and has a great laid back beach feel. Whether you are on the bluffs, closer to town, or steps from the ocean, you can find everything from entry level condos to multi million dollar ocean view homes. Westchester is just north of LAX and considered part of the “Silicon Beach” phenomenon meaning the home prices have accelerated rapidly over the last few years due to the proximity of all the tech jobs found around Playa Vista and Venice. Unlike many of the other neighborhoods I write about which have beach front, hipster stores, cool restaurants and ocean view properties, Westchester’s appeal is that it has none of that. Let me explain. If you are looking for a Single Family Residence and have been priced out of other Westside neighborhoods, living here is a great option. The only downside to some homes in Westchester is that depending on the location, expect to hear either planes or cars (if you are too close to the 405). Historically, the most expensive homes have been in the Kentwood neighborhood and the closer you get to the bluffs or Loyola, the more you might expect to pay. On the east side of Sepulveda Blvd, you’ll find Westport Heights. The neighborhood south of Manchester Blvd is the closest to the airport and homes there definitely sell at a discount. One of my favorite Westchester neighborhoods are the few blocks west of Lincoln Blvd before it becomes Playa Del Rey. Culver City is generally not considered part of Silicon Beach but I am including it here because a) a lot of tech jobs are flowing in, and b) it is adjacent to Westchester.